Chicago - Like many jobless Americans, Mr Gint Butenas is cautiously hopeful that things might be about to go his way. The 57-year-old information technology worker was laid off by a pharmaceutical firm in 2009. At the time, he recalls, the economy was losing 250,000 jobs a month, so he saw little point in even looking for work. After completing a master's degree to better his IT skills in 2010, he is looking for a job and noticing signs of improvement. 'I am being contacted more, and I have had a couple of interviews,' Mr Butenas said as he attended a technology job fair at DePaul's satellite campus in downtown Chicago. 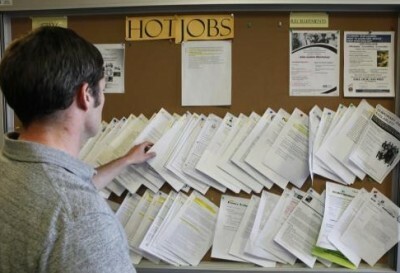 Fifty employers were accepting resumes. Data released on Friday showed many more Americans who gave up looking for work flooded back into the labour force last month as the hangover from the 2007-2009 economic crisis shows signs of easing. For the third month in a row, the US economy created more than 200,000 jobs, still a small dent in the millions of jobs lost since the start of the recession. The labour force participation rate - the percentage of working-age Americans either with a job or looking for one - rose to 63.9 per cent from 63.7 per cent in January, a report from the Labour Department said on Friday. Though the rate remains near a 29-year low, it was the biggest monthly jump since April 2010. Many job seekers never gave up looking and their perseverance is starting to pay off. Mr Julian Robinson, 47, just started work as a financial analyst at a New York hedge fund, two years after being laid off by another firm where he worked for more than three years. Despite his actuarial skills, the job search was not easy. He had 20 to 30 phone interviews, but firms often rejected him because he was overqualified for the position he had applied for. Then in the past month, he was offered two jobs. 'I think it's sometimes being in the right place at the right time,' said Mr Robinson. Ms Natalya Podgorny, 31, is hoping for the same luck. Since leaving a magazine publishing job five months ago, she has networked, revised her resume over and over, applied for positions online and in person, and taken classes at New York University to sharpen skills. Though she estimates only one in 15 firms responded to applications, she sees some doors starting to open. 'It's been a little discouraging, but I've had a number of personal contacts in the past week, so I've noticed a change,' said Ms Podgorny, 31, with a pile of resumes in hand at a job fair at Madison Square Garden. 'I just didn't ever expect it to take so long. I wouldn't have left my old job without a concrete plan if I had a sense of just how long it would take,' she added.